Women’s focus on education, health care played key role in Patrick win In the lead up to last Tuesday’s midterms, voters consistently rated the economy as by far the most important issue, both in Massachusetts and nationally. Despite its elevated importance however, the economy was not the decisive issue in the Massachusetts gubernatorial election. Deval Patrick and Charlie Baker effectively battled one another to a draw on the economy, neutralizing the issue's impact on the final outcome. Among who said the economy was “very important” in deciding their vote, 46 percent went to Charlie Baker, and 43 percent went to Deval Patrick, according to the MassINC Polling Group Post Election Poll. This 3 point spread is within the poll's margin of error. Patrick’s victory on the issues came among voters focused on healthcare (+15) and education (+25), two other issues voters cited as important both in pre-election surveys as well as the MPG Post Election Poll. 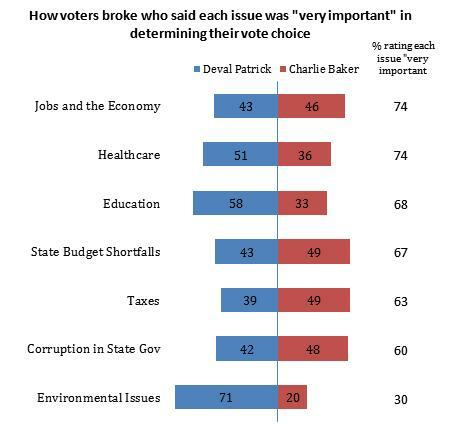 Healthcare and education were especially important to women in this election, a fact which helped Patrick run up a 24 point margin over Baker among female voters. Patrick’s margin among female voters easily overcame Baker’s 13 point advantage among male voters. These results are based on a poll by MassINC Polling Group of 500 voters who participated in the November 2, 2010 general election for Massachusetts Governor. Live telephone interviews were conducted November 3, 2010 via both landline and cell phone. The margin of sampling error is +/- 4.4 percent with a 95 percent level of confidence.